The Steigenberger Hotel Herrenhof Vienna is situated near many attractions including the Hofburg Imperial Palace, St. Stephen’s Cathedral, Albertina, Museumsquaritier and the Kohlmarkt Shopping Centre. There are also many bars, cafes and restaurants located near the hotel. A variety of shopping venues is located in the local vicinity as well. The underground makes it easy to reach the many attractions in the city. The international airport is located within just a short drive of the hotel. 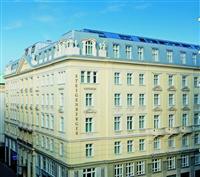 There are 186 guestrooms at the Steigenberger Hotel Herrenhof Vienna. Each of the rooms features en suite bath facilities, cable television, air conditioning, wireless Internet service, hair dryer and telephone. There are 10 suites available at the hotel. Guests of the hotel will be treated to amenities such as an on site café, restaurant, meeting facilities, laundry/dry cleaning services, elevator, 24 hour room service and business center. The hotel also offers a fitness center, two saunas and a steam room. In addition, a hotel safe and currency exchange facilities are available.